Season three of Doctor Who ran from September 11, 1965 to July 16, 1966. It had 45 episodes spread over 10 stories. It is the longest single season in Doctor Who history. Not only does it contain the shortest story at one 30-minute episode called Mission to the Unknown, but it also contains the longest story at 12 episodes called The Daleks' Master Plan. This season saw a lot of change. Verity Lambert, the original producer of the show, had left at the end of the previous season. We also had several changes to the companions in a single season, and an episode that attempted to be a musical. Hartnell's era of Season four ran from September 10, 1966 to October 29, 1966. His portion of the season had 8 episodes spread over 2 stories. The rest of the season, the Doctor was played by Patrick Troughton. The first story is mostly a forgettable one, but the second story is vastly important and I shall talk about it below. Unfortunately a good portion of what I had said above we won't get to talk about here. Seasons three and four are the two most devastated by the lack of archiving footage. These two seasons had nineteen stories spread among them (this would include both Hartnell and Troughton's portion of season four.) Out of those nineteen stories only six of them have enough footage to release on DVD. At that, only three of them are fully intact without needing animation or still reconstructions. Expect this to be short. Important Notes from the missing stories 18-22. Vicki leaves the TARDIS in The Myth Makers where she decides to stay behind in ancient Greece to later be known as Cressida (Google it if you don't know.) In that same episode we pick up the short lived Katarina who believes the Doctor is Zeus. She and a couple other possible companions who are picked up in the next story die in that same story, the Dalek's Master Plan. At the end of the fifth story, The Massacre of St. Bartholomew's Eve, the TARDIS lands in London in the 60's again and picks up a new companion, Dodo. She's nice but not exactly the brightest person to have around. The first story we can watch (6th of the season) is The Ark and it's four episodes long. This is Dodo's first trip with the Doctor. The TARDIS lands on a spaceship who has left Earth in the far future. At the same time, Dodo starts showing signs of having a cold. It turns out that at that point in the future, the sun was going to expand and destroy the Earth, therefore the humans built the Ark to find a new hospitable planet. The closest one being 700 years away. They share the ship with a race of aliens known as the Monoids; they joined the humans because their home planet has been destroyed as well. Apparently the human and monoid races have not been in contact with the common cold for several thousand years and Dodo's virus starts killing people. The Doctor finds a cure and they leave in the TARDIS only to land in the ship once again but this time 700 years in the future. A second wave of the cold virus had killed most of the humans and the monoids took over the ship. The monoids have made the humans into slaves and plan to not allow them on the new planet they have just arrived at. Eventually, the Doctor frees the human slaves and with help from the giant invisible alien race on the destination planet, work out a peace agreement among all 3 peoples. This story is weird. It's yet another one that people say is fairly bad but I like because of it's uniqueness. It's the first story we've had where it seems as though the adventure is ending earlier than expected. It's also the first REAL time that the Doctor has come back to a situation after he had previously helped before. The last episode's focus on invisible aliens and a lot of random shooting is just the icing on the cake of this weirdness. If this sounds decent to you then check it out. The next story available to us is The Gunfighters and it's four episodes long. When the Doctor gets a toothache, the TARDIS lands so that he can see a dentist. Unfortunately, the TARDIS has landed in Tombstone, Arizona and the dentist is Doc Holliday. 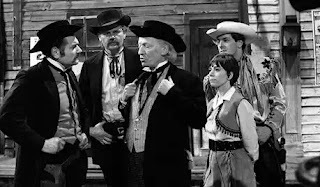 The Doctor, Steven, and Dodo end up getting involved with a group of outlaws, the Earp brothers, and Doc Holliday for several of your favorite Western tropes. This all culminates in the famous gunfight at the OK Corral. There's also singing... lots and lots of singing. This story isn't just a western...it's a musical! This setup would be perfect for something like Red Dwarf or another show aimed at comedy because it honestly sounds absolutely hilarious... but no this is played straight. Hartnell really wanted to do a Western and this was his chance to do so. Somewhat unfortunately, somebody decided this should be a musical. It seems, however, that the production team must have not been informed that a musical needs more than just one song. The on-screen characters as well as a narrating woman sing varieties of "The Last Chance Saloon" no less than 30 times in these four episodes. It gets as repetitive and annoying as you would expect. The western stuff is pretty standard. If you've seen any western movie then you pretty much know what all is included here. Of course since this was Britain in the 60's there were no American actors added to the mix; this leaves everyone putting on a semi-comedic American accent. It's just the repetition of that blasted song that makes this difficult to watch. Since Doctor Who rarely does Western settings and this one has the musical element it's almost too bizarre to pass up. Story 26 is The Savages and this is the story that Steven leaves the TARDIS to help out two societies make peace. The next story available to us is The War Machine and it's four episodes long. The Doctor and Dodo land in London in 1966, the then present of the time. A scientist has developed a super computer named WOTAN and is going to link up the major computer systems of the world together. Unfortunately WOTAN has decided that society would be better if run by him so it somehow hypnotizes people into building giant war robots for him to control and start killing people. In order to get the Doctor to assist, WOTAN hypnotizes Dodo and sends her to fetch the Doctor. The Doctor figures this out and restores her to normal. He then sends her off to her family in order to recover from the ordeal. The Doctor then teams up with the scientist's secretary, Polly, and a young sailor, Ben, to stop WOTAN and the War Machines. 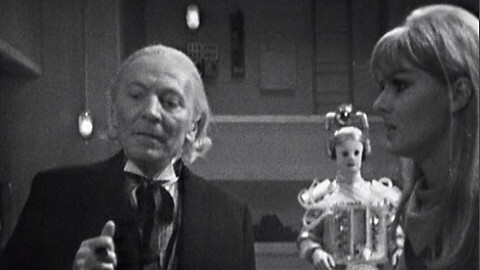 Dodo decides to remain with her family and the two new young people join the TARDIS unbeknownst to the Doctor. This one is notable for a few things. The Doctor is constantly being called "Doctor Who" as that is what WOTAN keeps insisting his name is. Dodo also gets a giant middle finger in this story as she spends most of it hanging around with Polly, being hypnotized, and gone. Jackie Lane's contract wasn't extended mid-story so she didn't even get a goodbye scene which is a real shame. Also Ben and Polly join the TARDIS and are the First Doctor's last companions. Polly is a fashionable young girl who is fairly bright, and Ben is a headstrong sailor. They were an excellent team to place with the First Doctor. This story also set the template for a lot of the modern show as it was the first full story to be set in present-day London without any weird shrinking shenanigans. The last story for the First Doctor is the Tenth Planet and it's four episodes long. The TARDIS lands in the snow during the 1980's as a global energy crisis is upon them. It's not long before they are captured by the military for questioning. As this is happening, a new planet appears in the solar system and beings from that planet begin to descend upon earth. The planet is Mondas, Earth's forgotten twin planet, and the beings are Cybermen. The Cybermen were once humans like us living on our twin planet but they started experimenting with different machinery and surgical procedures to extend their life. Mondas is dying and has returned to the solar system to drain the energy from Earth. The Doctor's energy begins to drain as well so it's up to the military, Polly and Ben to save the Earth from destruction. After Mondas explodes from absorbing too much energy, the Doctor starts his first regeneration process and he doesn't go out in a blaze of glory. He just sort of tires out, collapses in the TARDIS and regenerates. The Tenth Planet is more of an important story than it is a good one. It introduced the Cybermen, and I have to say that I do enjoy this very comical appearance they have. Since they were inspired by things like heart transplants and surgeries, the more organic look they have here makes sense even though it looks ridiculous. This story also introduced the idea of regeneration. At this point, William Hartnell's health was very poor and would only get worse with age. Having his Doctor regenerate because he was too tired to carry on was a very poetic way to send him off, although it would constantly be outdone by his future selves. The story is fairly straightforward and the fact that Mondas' destruction came by Earth doing nothing made me chuckle. It's not bad it's just not amazing. One last important thing about this story is that the final episode is lost. A children's TV show called Blue Peter borrowed the episode from the archives to do a segment on the Doctor's regeneration and lost the rest of the episode, so the only part we still have is the footage they used of the actual regeneration. For the DVD release the last episode has been animated which is nice. That concludes season three and the first part of season four. The sampling we are actually able to see were weird and interesting. The Ark and The Gunfighters were very bizarre and took some chances whereas The War Machines and The Tenth Planet were more standard but were very influential in one way or another. I just wish we could have seen some of the other episodes that we lost such as Galaxy 4, The Myth Makers, and The Celestial Toymaker. William Hartnell took awhile for me to really enjoy. This may have been because I was so used to the likes of Matt Smith at the time. 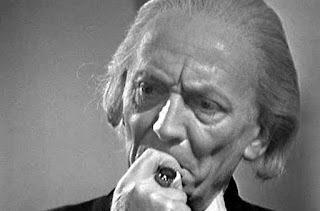 Given how long it took me to like the First Doctor, I honestly figured I would look forward to his departure... but I didn't in the end. It really just made me sad to see the old grandfather go. 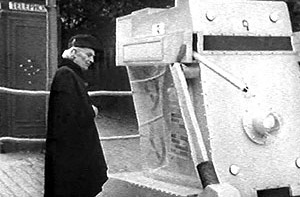 Thankfully we get to see the First Doctor at least three more times throughout the whole of the series thanks to helpful stories, another actor, and CG magic. Please join me again as we continue to examine all of Doctor Who.